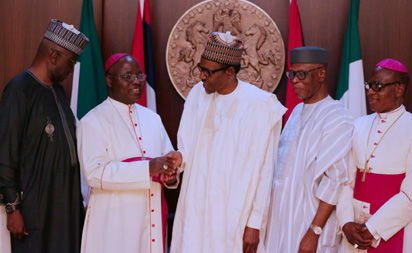 AN ADDRESS PRESENTED BY THE CATHOLIC BISHOPS’ CONFERENCE OF NIGERIA (CBCN) ON THE OCCASION OF A COURTESY CALL ON HIS EXCELLENCY MUHAMMADU BUHARI, PRESIDENT OF THE FEDERAL REPUBLIC OF NIGERIA, THURSDAY, 8 FEBRUARY 2018 Your Excellency, Preamble We, the representatives of the Catholic Bishops of Nigeria, bring you our cordial greetings and blessings. We desired this meeting, in order to continue the dialogue we initiated with you even before your election as President. We therefore thank you for granting us this audience, which affords us the opportunity to share with you, once again, our thoughts and concerns on some issues affecting our dear country, Nigeria. .R; President Muhammadu Buhari in a handshake with Former Archbishop of Ibadan, Felix Alaba Job. Others are Catholic Archbishop of Jos, Dr. Ignatus Kaigama, Archbishop of Lagos, Alfred Adewale Martins, Archbishop of Ibadan, Gabriel Leke Abegunrin and Bishop of Umuahia, Lucius Ugorji after a meeting with a delegation of Catholic Bishops held at the Council Chambers State House in Abuja. First, we thank God for bringing you back to us healthier and stronger after a period of ill health. We hope and pray that you continue to make progress on the way to full recovery, in order to be able to face the enormous challenges emanating from your exalted office. Your Excellency, needless to say that, as President, you are the Father of our dear country Nigeria. It is therefore pertinent that as loyal citizens as well as informed members of the society we come to you from time to time to express not only our willing cooperation with the government in working for the progress of our country, but also to share with you the feelings of the multitude of Nigerians at this moment. We work with the people at the grassroots and, therefore, have first-hand information about what they are going through. There is no doubt that when you came into office, you had an enormous amount of the goodwill of Nigerians, since many saw you as a person of integrity who would be able to bring sanity into a system that was nearly crippled by endemic corruption. Nearly three years later, however, one has the feeling that this good will is being fast depleted by some glaring failures of government which we have the moral duty to bring to your notice, else we would be failing in our duty as spiritual fathers and leaders. Our Concerns Your Excellency, there is too much suffering in the country: poverty, hunger, joblessness, insecurity, violence, fear… the list is endless. Our beloved country appears to be under siege. Many negative forces seem to be keeping a stranglehold on the population, especially the weaker and defenseless ones. There is a feeling of hopelessness across the country. Our youths are restive and many of them have taken to hard drugs, cultism and other forms of violent crime, while many have become victims of human trafficking. The Nation is nervous. Just as we seem to be gradually emerging from the dark tunnel of an economic recession that caused untold hardship to families and individuals, violent attacks by unscrupulous persons, among whom are terrorists masquerading as herdsmen, have led to a near civil war situation in many parts of the country. We are saddened that repeatedly innocent citizens in different communities across the nation are brutally attacked and their sources of livelihood mindlessly destroyed. Property, worth billions of Naira, including places of worship, schools, hospitals and business enterprises are torched and turned to ashes. We are still more saddened by the recent massacre of unarmed citizens by these terrorists in some communities in Benue, Adamawa, Kaduna and Taraba States which has caused national shock, grief and outcry.